This blog is part 2 of the fourth blog in the series on eCommerce personalization. 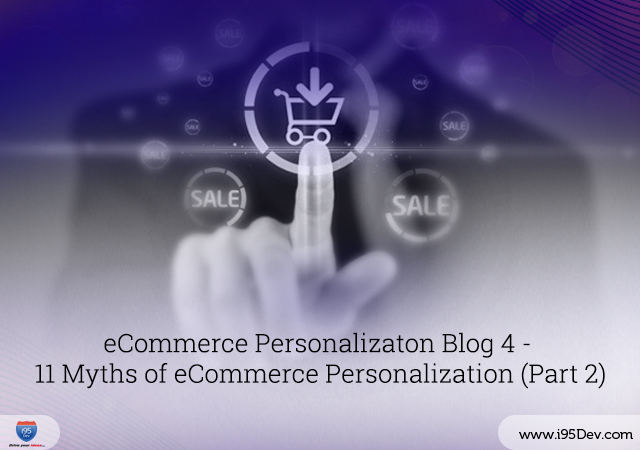 If you have not already read our earlier blogs, we recommend you to read them here – Blog 1 – how the concept of eCommerce personalization evolved, Blog 2 – data you can leverage to arrive at the right ecommerce personalization strategy, and Blog 3 – 6 Benefits of eCommerce Personalization. In the last blog 11 Myths of eCommerce Personalization – Part 1, we had looked at 5 common myths in eCommerce personalization – Personalization requires too much time and capital, Personalization is for big eCommerce players, Personalization requires a lot of data, My products/ industry does not require personalization and My customers are paranoid about privacy. In this blog, we will look at the remaining 6 myths. Recommendations are based on past data which are driven by powerful tools which constantly track and analyze user behavior. The analysis then help dish out recommendations during subsequent user visits. While recommendations can be based on behavior of other users they become even more effective when they’re specific to that individual user’s behavior. Predictions on other hand anticipate for the future. A predictive tool uses algorithms to answer questions such as When will they buy next? How much will they spend? What will they read? etc. The best way to use these two to maximize the businesses benefit is by using the predictive engine to anticipate users who will buy next and then recommend the right products to purchase using the recommendation engine. This automated approach can supercharge your marketing ROI. Personalization is no longer used as a tool to only help segmenting users before a campaign, it is now used as a process to engage customers on a stronger level and build long term relationships with them. In fact, 78% of consumers believe that organizations providing custom content are investing in building good relationships with them. Personalization, also referred as persona based marketing, is a means of creating a long lasting relationship with consumers by knowing and using data related to them, their behavior and their context. By engaging consumers and gathering more and more information about them throughout the buyer journey, however long that might be in your industry, you will be able to create even more personalized content and an even better customer experience. Personalization is thus that which sets off with a long term objective, incidentally bringing with it all short term benefits as well. This is one of the most common myths that stems from how the entire act of personalization is perceived. Myths that personalization requires a lot of data (Myth 3) and recommendations and predictions are the same thing (Myth 6) are at the code of this belief. However, what is true is that with the right technology in hand, a personalized user experience can be achieved for first time visitors as well as against to those who are returning. An effective personalization strategy is that which constantly evolves; just like all any technological advancements. The entire exercise of personalization has its own maturity and learning curves, and is heavily dependent on data that is obtained via different channels. It would wise to conclude that each e-retailer is at a different stage, with respect to personalization. Above all, it is important that personalization is considered to be a growth opportunity, one of a kind that can be categorized under a comprehensive testing and optimization strategy for businesses. For starters, marketers might start off with personalized email templates, where in the content is determined by user actions across channels, interests etc. Which is then updated as the user behavior evolves; in other words rework on your personalization strategy. In all, personalization has to begin somewhere and evolve; at some stage it might look incomplete but it should never be non-existent. It is a fact that eCommerce is slated to grow 10 percent annually through 2018, and from there the growth will exponentially increase with the spending power of digital natives. The customer today is all aware; and he is constantly absorbing information about brands through multiple channels. So, with all that knowledge, the desire for better customer experience is a consequence. Gone are the days of face-to-face interactions that brought in loyalty, the attention received during in-store shopping experiences are a thing of the past. We are in an era of digital engagement that will mandate personalization giving marketers an opportunity to showcase products that are of genuine interest to their audiences. The right digital engagement today can be deciding factor between choosing one brand over the other. A majority of digital marketers are just about getting started; this domain is volatile there is always room for opportunity to explore new techniques, experiment, and learn and deploy. Consider this, according to Salesforce Marketing Cloud only 29% of marketers today invest in website personalization and use of behavior-based data. And an eConsultancy study found that even among online retailers only 62% are doing personalization, in some form. The key is to get started, one step at a time. Opening up your mind to change the way you carry out personalization impacts the way you sell. Remember that eCommerce personalization is a systematic way to market goods to your audience in the digital arena; all it needs it is the right approach. We shall proceed to dealing with the how of it in detail in the blog that follows. Let us know your thoughts by commenting below.